As many of you know I have been declaring for decades that the mark of the beast is the Sunday Sabbath invented by Rome. And I have both historic and Scriptural evidence to back this up online. In fact, I have shown for years that every prophecy that has ever been written in Scripture that speaks about the Antichrist's beast system have been fulfilled by the Popes of Rome. I have 26 of my favorite prophecies confirming all this listed here. But to keep this short, I will only share one of those prophecies that is in fact my all-time favorite that makes it very easy for me to share this truth in a quick manner. It has to do with the prophecy found in Revelation 17:8 that says "… behold the beast that was, and is not, and yet is." No other prophecy makes it that easy to show how accurate Christian prophecy is. And after you see how easy it is to share this, you too may agree and use this when asked how you know for a fact that the Vatican is in fact the prophesied Beast system. But first notice these historic facts so as to better understand the prophecy. And just so you know, this is just one prophecy locking it down like this. I have many more listed all over my main website. The Catholic church first gained its political and religious power when "Vigilius…ascended the papal chair (538 A.D.) under the military protection of Belisarius." (History of the Christian Church, Vol. 3, p. 327) During this time, and as prophesied, the Vatican went about killing Christians for 1260 years. As I have stated in many studies, sermons and videos; that period of time is what the prophet Daniel and the prophet John predicted in their books and Jesus Himself called the "Great Tribulation" in Matthew 24:21. But for the prophecy to be accurate, we have to see something drastic happening at the end of the 1260 years to where the Beast system is to lose its power. That would be the exact year of 1798AD. And in the Encyclopedia Britannica 1941 edition as well as many other historic sources, it was confirmed that "In 1798 General Berthier made his entrance into Rome, abolished the papal government, and established a secular one." If you do a proper study you will find this was also prophesied as the time the beast received its mortal wound. And according to prophecy, that wound will eventually be healed and so do we find any moment in time where the wound was beginning to heal and the Beast system came back into political and religious power? Notice two of many articles posted back in 1929. And so, getting back to my favorite prophecy exposing the Beast system. Notice again what it says in Revelation 17:8. It said, "… behold the beast that was, and is not, and yet is." …and is not: This is the time span from 1798ad forward that the Popes had no political as an independent State. Its power was literally non-existent during this time. …yet is: This if from the signing of that document in 1929 to present. From that day forward the Roman Church has been a church & state. Now, in order to figure out what the Antichrist's Beast system will declare as its mark, we need to find out what the seal of God is because as we know, Satan always uses God's law as a way to both mock Him as well as seek counterfeit worship by claiming to be a god on earth. That being said, have you ever signed a document to validate or confirm that it is authentic? Have you ever given your seal of approval on something? Have you ever marked an item of yours as proof of ownership? In government, this is an undeniable fact of life. As we know, signing a document actually authenticates that document. Government declarations must always bear a mark, or an official seal of approval on it for validity. But what are the actual features of an official mark or seal made by governing bodies? In that passage we see all the necessary features of an official seal. And so notice this. Now that we know that the seal of God is in fact the fourth commandment that declares Him to be Creator; and by keeping His Sabbath you acknowledge Him as Creator by declaring after He finished creating all things, He rested and made that day holy as an eternal reminder that He is in fact Creator God. After all, is it not written in Psalm 77:11 that "I will remember the works of the LORD: surely I will remember thy wonders of old." And how can we remember Him in ways that declare Him Creator? The fourth commandment plainly says, "Remember the sabbath day, to keep it holy." 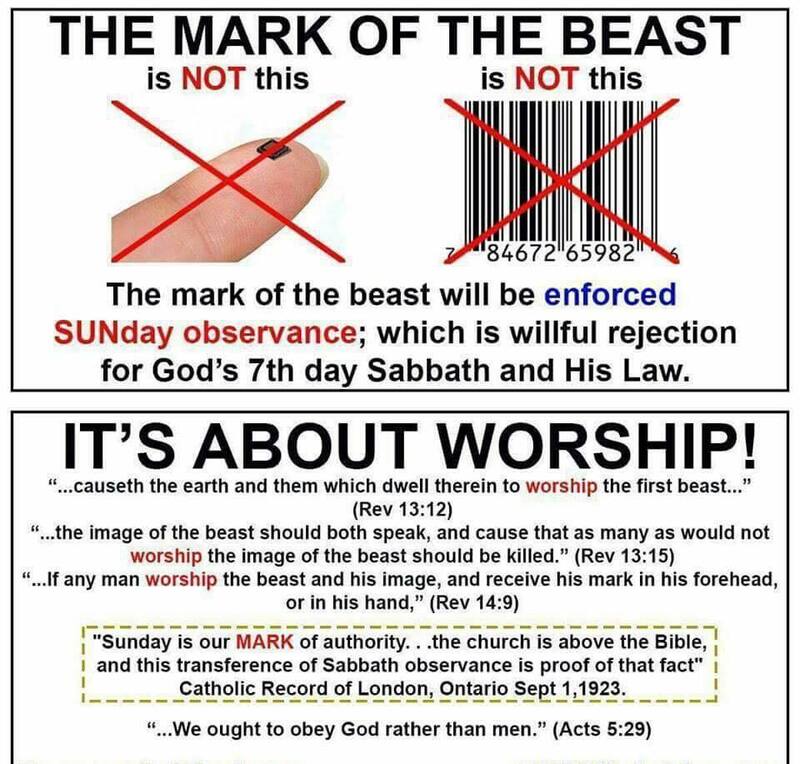 Seeing how Satan via his Beast system demands worship as well as a way to mock the Lord; does he have his own Sabbath and does he too declare his Sabbath to be his seal or mark? I will let the Popes of Rome who has been proven to be not only the man of sin, but one that worships Satan openly in the Vatican and even makes buildings dedicated unto him. And so what has the harlot in Rome openly declared to be their official mark in writing? "Of course the Catholic Church claims that the change (Saturday Sabbath to Sunday) was her act… And the act is a MARK of her ecclesiastical authority in religious things." -H.F. Thomas, Chancellor of Cardinal Gibbons. "Sunday is our MARK of authority. . .the church is above the Bible, and this transference of Sabbath observance is proof of that fact" -Catholic Record of London, Ontario Sept 1,1923. GOOGLE says Jesus is coming! → ← Scary Rapture Prank!